Here are my two original guinea pigs. The little dark one is Dilbert, who happens to be a male. The other one, is Einstein, a female. This was not done by design, and after discovering his true nature I was going to take Dilbert in to be “fixed” (sorry Dilbert). Male to male, I couldn’t bring myself to do it, but I did not wish to have dozens of little guinea pigs to find homes for. The two of them got along fine, and were quite a bit of fun. They were kept apart most of the time, because Dilbert wasn't fixed, and were only allowed together under close supervision. They are amazingly affectionate, for such little things with such small brains. They are quite timid and a bit high strung, but will warm up to someone they get to know. These are social little animals and will get lonely if they are left alone and not shown some attention. This is one of the reasons I got a pair of them, rather than a single individual. They were kept in separate enclosures, right next to each other, so each knew the other was there. I handled them often, and allowed them to play together, but the visits were limited. Despite their well known timidity, guinea pigs are quite curious, and do love to explore - once they are certain that the coast is clear. They are very good at finding and memorizing paths, and are reasonably intelligent. Though they are widely considered not to be trainable, my pigs all knew several words, generally knew their names, and were paper trained, to an extent, when running around the hall. They also got to know people, recognized my voice, and always knew when I was coming home, and stood to greet me. Guinea pigs love to chew, and like to have hiding places. A guinea pig with a newspaper to hide under, and a piece of wood to nibble on (or better yet, a carrot), is a contented little creature. Once they have gotten used to being handled, they really enjoy being stroked and scratched. They will moan, purr, and chirp while being handled by a human they feel comfortable with. They particularly seem to like rubs and scratches behind their ears, and will often stretch their necks out, or bob their heads up when I start doing this. These animals are strict vegetarians, and will not even consider any sort of meat product as food. Unlike rats, mice, and many other rodents, guinea pigs do not scavenge, and are constant grazers. They are more closely related to chinchillas than to rats and mice. They love grass, but will settle for hay. They are especially fond of carrots, though I have had good luck feeding them kiwi, oranges, cranberries, spinach, grapes, cilantro, and parsley. They need some hay every day, and must have food that contains vitamin C. Like humans, guinea pigs need vitamin C, and can be fussy eaters, and develop individual tastes. They will not eat foods that they don't personally like. Dilbert liked pizza crusts, but Einstein would will not touch them. She liked little bits of banana, which he did not care for at all. Guinea pigs are quite verbal. They have a series of calls, and will call to each other, or to their human companions. 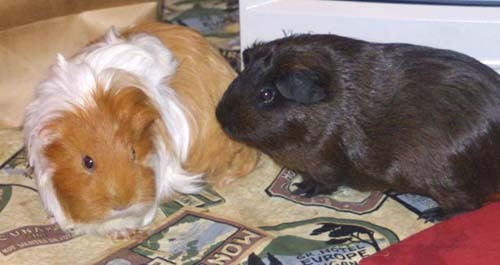 They coo with contentment when properly handled by someone they like, and growl when they are nervous, excited, or introduced to another guinea pig they do not know. I can generally expect to hear a chorus of high pitched squeaks, and commotion when I go into the refrigerator and rustle the carrot bag. They often call to me in the morning when I wake up, wanting some attention from me before I go to work. Guinea pigs have excellent hearing, a better sense of smell that humans (though not as acute as that of dogs), and can see in color, though their vision is only fair. They identify each other by smell, but their really outstanding sense is that of hearing. This is probably their main sense, and it served them well in the grasslands of South America, where they originate. If I ever do decide to get more guinea pigs, I would prefer to acquire some from the current surplus population, rather than enable the creation of new ones. They breed quickly, and the pet stores, and shelters are full of them. They do require a certain amount of care, and unfortunately many are not cared for properly, or are bought for children who soon tire of them. They are then relegated to a life of solitude in dirty cages, in many cases without being fed often enough. Eventually this may come to the notice of parents who then try to foster the sad little animals off on friends, pet shops, or animal shelters. It is even sadder to consider the millions of these sweet little creatures, which are used for research, as live food for snakes and other exotic pets, or are just plain abandoned or abused. These little animals also have been, and still are, raised as food sources, in South America. Animal rights people often just make things worse. They will sometimes break into labs and free animals which have already been damaged and will probably not survive. This only means that a new batch of innocent little creatures will have to suffer when the experiments are run over again. There is nothing really to be done about this. Biological research will not stop because of the complaints of a few animal lovers, owners of exotic pets will simply say that similar things go on in nature (this is untrue; the food chain in nature works far differently, than the perverted caricature set up by snake owners), and you can’t tell people to stop eating. The best thing that can be done is to treat pet guinea pigs with as much kindness, and affection as can be mustered. The others are beyond help. It is rare for a guinea pig to live for more than eight years: five years is more common. So what do my pigs eat? Certainly pellet food makes up the bulk of their diet; but there are many supplements. I have never met a pig that did not love carrots. The same holds true for lettuce, though Iceberg lettuce is the pig equivalent of junk food, having little nutritional value. Romaine lettuce is better, and a spring mix, of various greens, is better still. Spinach is well liked, but can cause problems in some pigs, with kidney and bladder stones. Most of the pigs that I have had, liked cantaloupe. All of them love fresh picked grass; but you have to be careful to get grass from a place that does not use fertilizers, or insecticides. One thing I have learned the hard way with with guinea pigs is that you have to immediately respond to any signs of sickness, loss of appetite, or lethargy. They go so fast, that a guinea pig can appear perfectly fine in the morning, and be dead by the next day, or even by the evening of the same day. 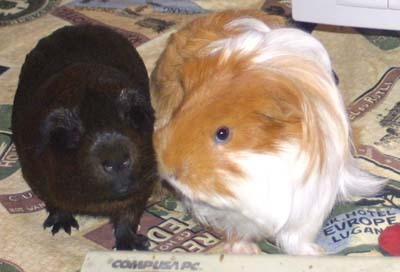 Notable things to watch for with guinea pigs are their teeth, respiratory problems, and kidney or bladder stones. They are also subject to the usual things afflicting all small animals, such as ticks, various infections, and all of the normal diseases. If you should notice a guinea pig not eating, IMMEDIATLY see a vet. A pig that doesn't eat, can be dead within a day. Though I would love to keep lots of little guinea pigs around the house, rescuing them from the shelters, I have limited myself to keeping two at a time, and to trying to give them the best life that I can. Taking on more, I would not be able to give them sufficient time or attention, which would make living with me, little better than living in a shelter. So what would be the point? I want to make a real home for my little friends, not a glorified shelter. They are, in truth, wonderful little animals, with individual personalities, and a great deal of affection. They are able to recognize their owner's voice, and even foot steps. Despite being very timid and skittish, they become very trusting, once they get to know you. I even had one guinea pig (Einstien), that befriended my parakeet. Looking at these pictures, and writing these pages makes me wish I had them all back. it might be a bit crowded; but it would be worth it. Guinea pigs are getting to be fairly popular pets. In part this is because they are small, gentle, easy to take car of. and really quite affectionate. There is also the fact that so many of us are now renters, rather than home owners. Where dogs can sometimes tear the place up, bark, leave their droppings all over the yard, and need walks, guinea pigs do not bark and disturb the neighbors, do not destroy property, and are unlikely ever to injure a visitor or passer by. So, while many building owners and rental agencies do not allow dogs, or even cats, few will raise any objection to the clean, quiet, gentle little guinea pig. These increasingly popular little animals are now common in pet shops, and are now even found in humane societies, and animal shelters. In addition, they have inspired a loyal and dedicated following, which has spawned guinea pig shelters and rescues. The little three or four pound guinea pig may be small; but these companionable little animals can become as big a part of our lives as any dog or cat.